Buxa Tiger Reserve (BTR) lies in Alipurduar sub-division of Jalpaiguri district of West Bengal. Its northern boundary runs along the international border with Bhutan. The Sinchula hill range lies all along the northern side of BTR and the Eastern boundary touches that of the Assam State. National Highway No.31 C roughly runs along its southern boundary. It is the eastern	most extension of extreme bio-diverse North-East India & represents highly endemic Indo-Malayan region. The fragile "Terai Eco-System" constitutes a part of this Reserve. The Phipsu Wildlife Sanctuary of Bhutan is contiguous to North of BTR. Manas National Park lies on east of BTR. BTR, thus, serves as international corridor for elephant migration between India and Bhutan. The reserve encompasses as many as eight forest types. Buxa Tiger Reserve created in 1983 comprises entire forest area of erstwhile Buxa Tiger Division and some territory of neighboring Alipurduar Forest Division. 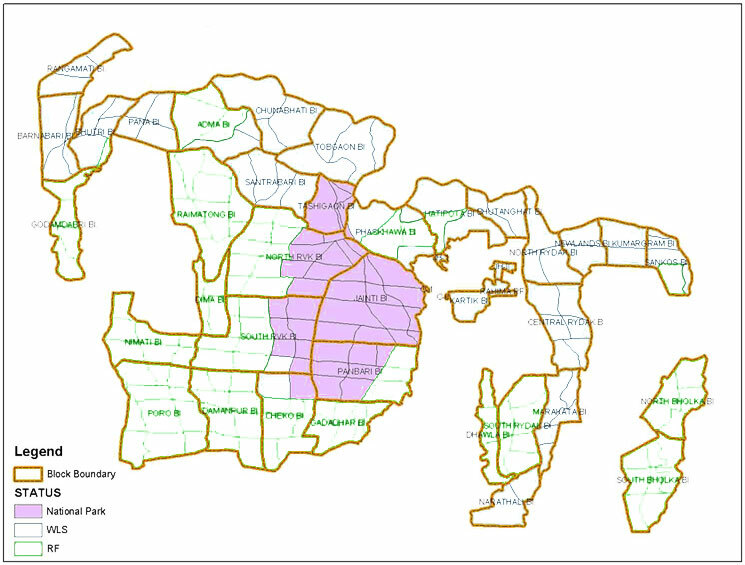 In 1986, Buxa Wildlife Sanctuary was constituted over 314.52 km. of the Reserve forests. In the year 1991, 54.47 km. area was added to Buxa Wildlife Sanctuary. A year later, in 1992, Government. of West Bengal declared its intentions to constitute a National Park over 117.10 km. of the Buxa Wildlife Sanctuary. State Government finally declared National Park vide notification No.3403-For/11B-6/95 dt. 05.12.1997. The historic Buxa Fort (2600 feet above m.s.l.). People have sentimental attachment with the fort on accounts of its association with the struggle for freedom. Once Netaji Subhas Chandra Bose was confined inside the fort. A sacred temple - Mahakaleshwar Jyotirlinga - lies in BTR. Around 10,000 devotees of Lord Shiva congregate here on "Shiva Chouturdoshi"
More than 300 species of trees, 250 species of shrubs, 400 species of herbs, 9 species of cane, 10 species of bamboo, 150 species of orchids, 100 species of grass and 130 species of aquatic flora including more than 70 sedges (Cyperaceae) have been identified so far. There are more than 160 species of other monocotyledons and ferns. Main species The main species constitutes trees like Sal, Champ, Gamar, Simul, Chikrasi. In the Reserve 390 species of birds, 73 species of mammals, 76 species of snakes, 5 species of amphibians have been identified so far. In a recent survey (2006) it has been found that Buxa Tiger Reserve has the highest number of fish species in the North Bengal region. Apart from tigers animals like Elephants, dhole, bears, civets, giant squirrel, Gaur, Chital, clouded leopard, wild Buffaloes, antelope and snakes including the regal Python are found here. About 230 species of birds and innumerable butterflies add colour to the forest. The rivers of Raidak and Jayanti which flow through the forest and the Narathali lake are home to migratory birds as well as endemic ones which abound the place. The Hornbills including greater Pied Hornbill, Ibis Bill, Trans Himalayan Migratory Goosanders, Red-stars, Wag-tails, the rare black necked crane, migratory common teal, black stork, Large Whistling Teal, Minivets, White Eyed Poachared are some of the bird species sighted here. Two new species of frog have been discovered in the park in the year 2006. Main species The main species include Asian Elephant, Tiger, Gaur, Wild boar, Sambar,Wild dog (Dhole) . Endangered species Some of the endangered species found in BTR are Indian Tiger, Asian Elephant, Leopard cat, Bengal florican, Regal python, Chinese Pangolin, Hispid hare, Hog deer etc. Most rivers enter BTR from Bhutan. They carry huge amount of bed load. They obliterate beds of BTR rivers. Flooding is frequent. Critical habitats are lost. Over one lakh cattle graze in the Reserve daily. Weeds, unpalatable grasses and shrubs have invaded the over grazed areas. Hilly, Bhabhar and riverine tracts of core suffer from fire. Generally NTFP collectors and shepherds put forests on fire. No frequent poaching cases. Tribal population in tea gardens poach small mammals during Holi festival illicitly as part of ritual hunting. Bodo militants from Assam occasionally enter core. Timber thieves operate in the area. Five forest hamlets in hilly tract viz. Adma, Chunabhati, Santrabari, Tobgaon and Tashigaon have some encroachments by way of unauthorised Orange Orchards as follows. Trekking: Buxa (2600 ft) is a two hour trek(around 3 km) through picturesque surroundings from Santlabari, the starting point. 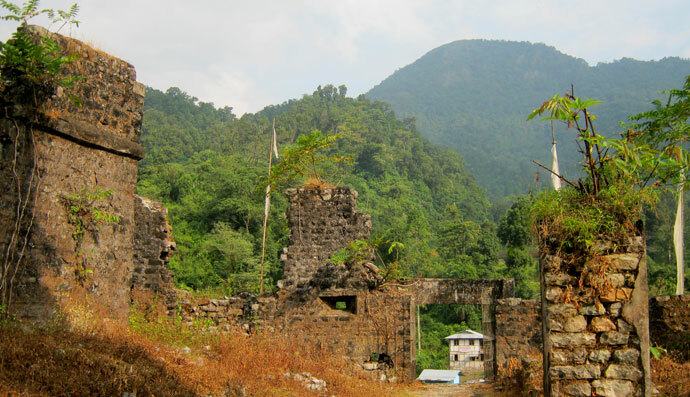 The Buxa Duar fort here was used as a prison by the British, because of its remoteness. Many freedom fighters were imprisoned here. After independence, it served as a refugee camp for Tibetans and Bangladeshis. There is a 4 km further trek to Rovers Point (the land of unknown birds at 4500 ft) or a 14 km trek to Roopam Valley in Bhutan from Bhutan. From Buxa, one can also take the 13 km trek to Jayanti through the beautiful jungle preferably with a guide. There is a stalactite cave, popularly known as the Mahakal cave at Jayanti. Another entry point Rajabhatkhawa (17 km from Alipurduar) has an orchidarium, animal rescue centre and a nature interpretation centre. Park safari : One can have a park safari by car or jeep by taking permission from the Forest Office at Rajabhatkhawa or at Jayanti. Other : You can visit "Pukri Mai", a small sacred pond situated inside the park(approach from Jainti) where fishes like Magur and Singiand Turtles are found. Festivals are held at certain time of the year by both Buddhist and Hindus and local tribals. By Road: NH 31 is the main highway. One can hire a car from Alipurduar.